Two US soldiers, a sniper (WWE star John Cena as Sergeant Matthews) and his spotter (Aaron Taylor-Johnson as Sergeant Isaac), have been sent to check on pipeline contractors in a desolate area of Iraq. They find the civilians all dead and are themselves shot and pinned down in the desert by an assailant. The only protection is a precarious, crumbling wall, all that remains of a bombed building. The stage is set for an intense psychological thriller in which war is pared down to its starkest and most dour basic: the fight to stay alive. Doug Liman – working from a screenplay by Dwain Worrell, whose uncommissioned efforts went from the 2014 Black List into production via Amazon Studios – is known for his deftness with thrilling action (The Bourne Identity) and ambitious, big-scale spectacle (Edge of Tomorrow). With an obviously minute budget and short schedule he demonstrates he also has the right guerrilla indie skills to turn what is almost a one-hander, with its tight focus on Taylor-Johnson, into an atmospheric experience. With his buddy out cold in the open and his own wound bleeding out, Isaac has to gather his wits and engage in a nerve-shredding cat-and-mouse game with the man targetting him – a near-legendary sniper / bogeyman called Juba (voiced by the unseen Laith Nakli) who taunts him and gets into his traumatised head over the radio. This could have been quite ordinary, with nothing much to see except Matthews' grisly injury and streaked, unshaven face, and nothing deeply profound in the dialogue or monologuing. But, alongside cinematographer Roman Vasyanov (Suicide Squad), Liman makes the searing heat, wind and sand palpable. The sound design is exceptionally effective, reality is heightened, and Taylor-Johnson inhabits the braggadocious Ranger driven to desperation with conviction. If one's idea of a war movie is a cast of thousands amid big action and emotion then this might struggle to appeal, but it's a sombre, anxiety-inducing and welcome addition to the genre. General release from Fri 28 Jul. Two American Soldiers are trapped by a lethal sniper, with only an unsteady wall between them. 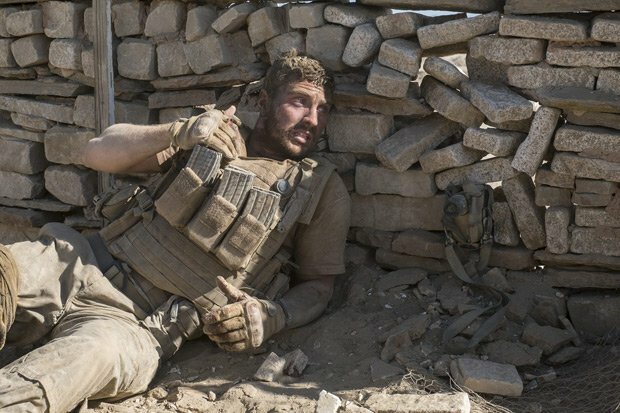 If one's idea of a war movie is a cast of thousands amid big action and emotion then this might struggle to appeal, but it's a sombre, anxiety-inducing and welcome addition to the genre.